Home » Films » Watch the first seven minutes of THE BROTHERS BLOOM. In 2005, I fell hard for a little hardboiled flick called BRICK. Rian Johnson was the man behind that film and I felt certain that the man that created BRICK would almost certainly bring more criminal goodness to the cinema. 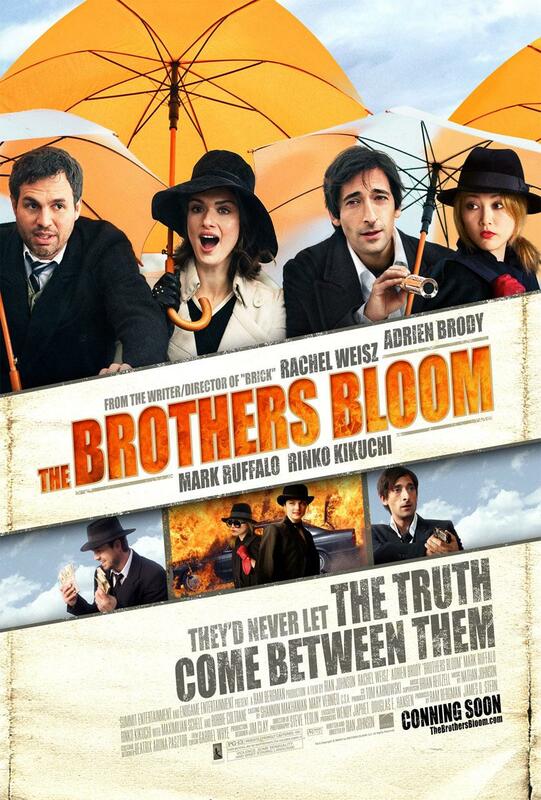 In Feb of 07, I first wrote about The Brothers Bloom. TBB is Johnson’s second film and is a caper flick. Inspired by the book The Big Con (Which also inspired The Sting), TBB stars Oscar winners Adrien Brody (The Pianist, Hollywoodland) , Rachael Weis (The Mummy, The Constant Gardner), and Maximilian Schell (Judgement at Nuremberg, The Black Hole) as well as Mark Ruffalo (Zodiac, All The Kings Men), Oscar nominee Rinko Kikuchi (Babel) and Robbie Coltrane (The Harry Potter films, U.K. version of Cracker). That is a pretty impressive list. Stephen (Ruffalo) and Bloom (Brody) are a pair of con artists (perhaps the best ever) that, after 20 years of working complex cons, decide to pull one last con: showing a beautiful and eccentric heiress (Weisz) the time of her life with a romantic adventure that takes them around the world. Sadly, the film has been pushed back again and again. I have survived the pain, thanks to booze and therapy, and eagarly awaiting the May 29th release. But we don’t have to wait that long to get a glimpse of The Brothers Bloom. Hulu (a fav site of my dear wife) is presenting the first seven minutes. So without further ado, I give you the opening scene of The Brothers Bloom.